What are the new rules when it comes to being successful in tech? 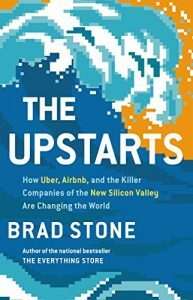 This week, RealSelf staffers got a firsthand look with our new reading program RealSelf Reads and Brad Stone, author of the new book The Upstarts. As a veteran journalist covering Silicon Valley for Bloomberg news, Stone visited RealSelf to talk about his latest book and participated in a wide-ranging conversation about Airbnb and Uber, and how these groundbreaking companies are rewriting the rules of tech. He covered topics ranging from how to build a brand, to flying cars, and other emerging technologies. Stone specifically talked about how both companies are ushering in a new era and redefining the way millions of people travel. He pointed out that neither Airbnb or Uber were the first to explore their markets — they just did it better than their predecessors. Both companies achieved success by finding and connecting with large audiences with needs and providing the best experiences to satisfy those needs. “When you create an alternative that people love, and present them with new economic options where the options are very constrained, they’ll flock to your brand,” he said. Why talk about Airbnb and Uber? As recent upstarts that have gone global, there are a few ways RealSelf can benefit from their playbooks. Stone stressed the importance of building trust with your audience to succeed, adding that companies need to embrace that responsibility and “walk in their customers’ shoes” to understand what they really want. As for flying cars? Stone had some good news for everyone commuting into the office. We’re hiring! Look over our career ops and apply today.